Zion Market Research has published a new report titled “CNG Dispenser Market by Type (Fast Fill and Time Fill), by Distribution(Company owned & Company run, Company owned & Dealer run, and Dealer owned & Dealer run), and by Flow Rate(Up to 15 kg/min, Up to 50 kg/min, and Up to 100 kg/min): Global Industry Perspective, Comprehensive Analysis, and Forecast, 2018–2024”. 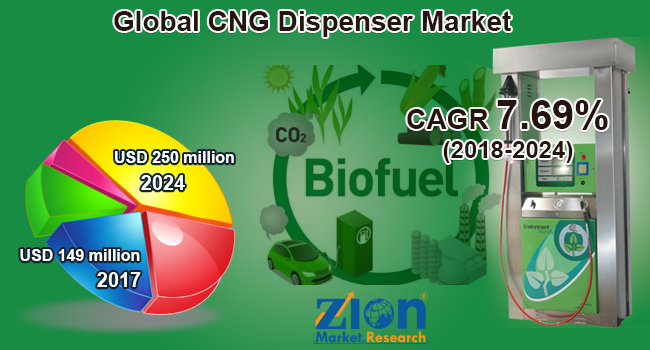 According to the report, the global CNG dispenser market was valued at approximately USD 149 million in 2017 and is expected to generate revenue of around USD 250 million by the end of 2024, growing at a CAGR of around 7.69% between 2018 and 2024. The rapid technological advancements made in the automotive sector coupled with the rising demand for high-performance vehicles are projected to fuel the growth of this market. The growth and development of the market are majorly driven by CNG’scapability to produce fewer carbon emissions. Additionally, the economic pricing combined with CNG abundance worldwide is likely to drive this market expansion. The concept of optimum energy utilization and its management is anticipated to positively impact this market's growth. The ongoing government initiatives across the globe to reduce carbon dioxide emissions are likely to boost the market's growth and development. There has been a significant shift from traditional fuel to CNG. Automobile companies are investing in their R&D to develop CNG engines for their vehicles, as CNG causes minimal air pollution as compared to conventional fuels, like gasoline. High calorific value, high energy density, and high combustion power are a few advantages of using CNG. By type, the CNG dispenser market is bifurcated into time fill and fast fill. The fast fill segment is likely to dominate the market in the upcoming years due to its usage. The fast fill stations are diversely used for refueling automobiles, such as pickups, vans, and sedans, which arrive at the fuel stations randomly and need to be refilled quickly. By distribution, the CNG dispenser market is categorized into a company owned and company run, company-owned and dealer run, and dealer owned and dealer run. By flow rate, the CNG dispenser market is segmented into up to 50 kg/min, up to 100 kg/min, and up to 50 kg/min. The up to 100 kg/min segment is projected to dominate the market, as this flow rate type is suitable for light-duty vehicles, such as vans, sedans, etc., that require quick filling. Asia Pacific is anticipated to witness the highest growth rate in the global CNG dispenser market in the forecast timeframe. The growth of this regional market is due to the improved and ongoing technological advancements made in the automobile sector. The increasing demand for the energy-efficient and fuel-efficient vehicles due to the rising per capita income level of the people is likely to foster this regional market’s growth. North America is predicted to hold a substantial revenue share in the global CNG dispenser market. The stringent government rules against air pollution and carbon dioxide emissions coupled with the ongoing initiatives to replace traditional old fuel vehicle with new CNG in the region are likely to boost the development of the CNG dispenser market. Some of the industry players operating in the CNG dispenser market include Compac, Bennett, Kraus, Censtar, FTI, Lanfeng, Sanki, Scheidt& Bachmann, Parker, Tulsa, Tatsuno, Dover, and Fortive. Zion Market Research is an obligated company. We create futuristic, cutting-edge, informative reports ranging from industry reports, the company reports to country reports. We provide our clients not only with market statistics unveiled by avowed private publishers and public organizations but also with vogue and newest industry reports along with pre-eminent and niche company profiles. Our database of market research reports comprises a wide variety of reports from cardinal industries. Our database is been updated constantly in order to fulfill our clients with prompt and direct online access to our database. Keeping in mind the client’s needs, we have included expert insights on global industries, products, and market trends in this database. Last but not least, we make it our duty to ensure the success of clients connected to us—after all—if you do well, a little of the light shines on us.